Click here to view current Critical Care opportunities. 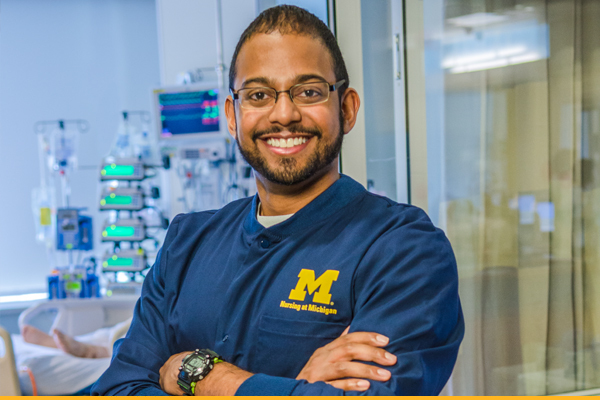 Critical care is among the most intense of nursing specialties at the University of Michigan Health System – dealing specifically with human responses to life-threatening illnesses, conditions and incidents. Practicing in settings where patients require complex, immediate assessments, high-intensity therapies and interventions, and continuous vigilance, our critical care nurses are first and foremost patient advocates – focused on supporting the values and rights of critically ill patients and their families. The University of Michigan’s air medical transport program, comprised of highly skilled critical care transport specialists, using the most advanced medical aviation equipment, available 24 hours a day, 365 days a year. Survival Flight’s mission is to rapidly transport critically ill and injured patients to definitive care, while providing the highest measurable quality of care while in transit. Survival Flight was born out of a collaboration of leaders—physicians, nurses, pilots, communication specialists, mechanics, managers, and administrators—all united in one goal: total quality patient care. For over 30 years, our transport system has remained a benchmark program by which others have been able to measure their own progress. Flights are completed by a team of highly experienced flight nurses ( who are dually licensed as paramedics) and Emergency Medicine residents and fellows. The combination of a skilled flight team and large, state-of-the-art aircraft enables Survival Flight to deliver university-level care at the bedside and in the air safely and efficiently. The UMHS Survival Flight teams are nationally recognized for their skills and expertise. Transports critically ill and injured patients from local or regional hospitals to specialized treatment facilities within the University of Michigan Health System or other tertiary care centers. Evacuates critically injured adults and children quickly and safely from accident sites to trauma treatment facilities. Transfers neonates and newborns needing specialized intensive care services. Transports organs and organ transplant teams from hospital to hospital. Provides back-up to public safety agencies for aerial searches, comprehensive triage and disaster management. A 15-bed, adult intensive care unit caring for patients in need of Neurology, Neurosurgery, and Otolaryngology services. Neuro-Intensive Care Unit (NICU) staff members provide holistic nursing care to patients and families, focusing on the physical, spiritual and psychosocial needs of the neurosurgery, neurology, and otolaryngology population. Our interdisciplinary team, consisting of the NICU Intensivist, Clinical Nurse Specialist, Neurosurgery Attending Physician, Residents, Interns, Dietician, Pharmacist, Pastoral Care and the NICU Nursing team, collaborates to meet the needs of our patients and their family in the critical phase of illness. Conditions most often treated in this unit are: post-operative craniotomies for brain tumors, cerebral aneurysm coiling and clippings, intracranial hemorrhage, surbarachnoid hemorrhages and hematomas, traumatic brain injuries, cerebrovascular accidents, spinal cord trauma, increased intracranial pressure, Myasthenia Gravis, and Guillian-Barre’ Syndrome. The SICU is a 20 bed unit delivering state of the art nursing care utilizing evidence based practice. Families are seen to be an integral part of the health, healing, and recovery of the patient. Our nurses care for patients who have had major operations or are experiencing complications requiring extensive physiological monitoring. Common patient conditions and procedures include: peripheral vascular diseases, cancer, hepatic, pancreatic or renal failure, cardiac, and pulmonary disease. Often these patients present with multi-system failure requiring swan ganz monitoring, ventilator support, parenteral nutrition, and fluid and electrolyte corrections, AFBs, renal revascularization, GI surgical procedures, oncological surgical procedures requiring intensive care monitoring, liver/pancreas/renal transplant surgery, ECMO, and CRRT. A 20-bed unit where nurses care for critically ill adult medicine patients. It is the primary aim of the Critical Care Medicine Unit (CCMU) nurses to work as members of a comprehensive, interdisciplinary health team to restore patients to an optimal level of functioning. Common conditions among CCMU patients include: respiratory insufficiency or failure, hepatic failure, renal failure, sepsis, coma, hypertensive crisis, GI hemorrhage, endocrine/electrolyte imbalance, and post bone marrow transplant patients who are experiencing complications. Our team is committed to maintaining constant communication with the patient and family regarding patient care. Contact and communication between the patient and family/significant others is encouraged and facilitated.This unit’s nursing care delivery system functions as a member of the interdisciplinary healthcare team, and features total patient care with interdisciplinary patient care rounds held daily. The staff of the Cardiovascular Intensive Care Unit will provide excellent nursing care with respect, compassion, and knowledge to the critically ill patient and family. Through professional collaboration with other health team members, evidence based practice and guidance from the American Association of Critical Care Nursing Standards, we strive to achieve distinction in a caring, safe, and supportive environment.